Where can you find cozy cabins tucked behind towering trees in full fall bloom alongside modern homes with screened porches and balconies looking out over the blue fog of the Great Smoky Mountains? Chalet Village North, in Gatlinburg, offers a variety of homes that all have one thing in common: an astounding view. Whether the trees are in their summer greens or their fall golds and reds, the view is sure to take your breath away. It isn’t hard to image curling up with a good book and a cup of steaming tea in a big, comfy chair by a window while snow softly coats the world. A home or cabin in Chalet Village North can offer all of this and more. The community of Chalet Village North offers many amenities in addition to the paved winding roads, soaring trees and mountain views. There’s certainly plenty to do indoors and out. Outdoor foosball and ping pong tables are sure to revive old rivalries in the best way, while a paved walking trail allows some cool down time. 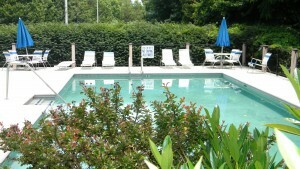 The clubhouse, yard games, three outdoor pools, 2 children’s pools, and lighted tennis courts offer seasonal enjoyment. A large pool deck surrounds the sparkling water, with rolling mountains offering a scenic backdrop to a summer day’s memory making. The tennis courts will l et you play a night game, with lights staying on until midnight. Plenty of decks and screen porches adorn the homes, offering the residents a beautiful view regardless of season. If the trees are rustling in the wind or bare for the winter, a mountain view is more than just foliage: there are birds, wildlife and the twinkling lights of nearby Gatlinburg, Pigeon Forge and Sevierville to delight the viewer’s eye. Homes are spaced so that each owner has privacy, and intermittent streetlights provide light for safety without polluting the night or interfering with stargazing. Does Chalet Village North sound like the perfect neighborhood for you? Contact our real estate agents to help match you with the right home for you. 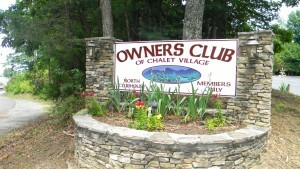 We have listings in Chalet Village North as well as other areas in Gatlinburg, Pigeon Forge and Sevierville. We have plenty of cabins and even distressed homes waiting for the right owner.